La produzione del vino rappresenta la primaria attività della Tenuta Montemagno e i risultati di tanto impegno non si sono fatti attendere. I vini DOC e DOCG prodotti nascono dalla straordinaria passione della Proprietà e dalla preziosa consulenza dell’enologo Gianfranco Cordero, i cui consigli hanno portato all’eccellenza un prodotto unico come la sua terra. Tenuta Montemagno lies in gently-rolling hills on the 45th parallel, a latitude that has always been known, right from the earliest centuries, for high-quality wine production. 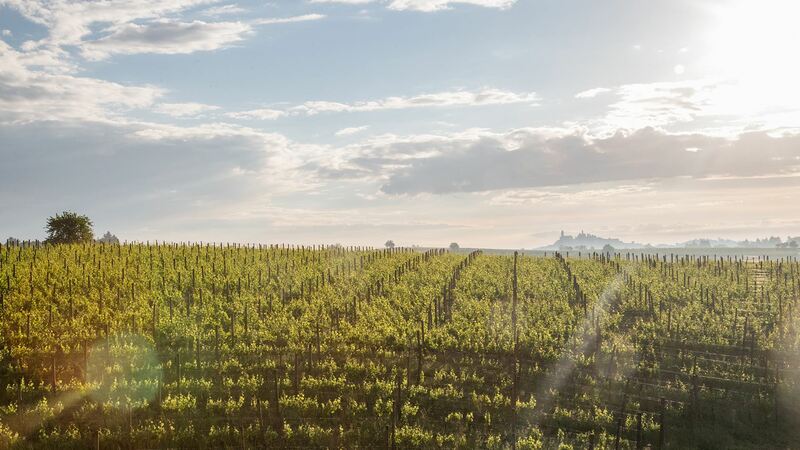 Our 100 hectares of vineyards include the most prestigious Piedmont denominations and wine-types: Barbera d’Asti, Grignolino d’Asti, Ruché di Castagnole Monferrato, Malvasia di Casorzo. But Monferrato yields great white wines as well, above all Timorasso and Sauvignon Blanc, which in our clay soils exhibits striking mineral notes and a rich bouquet. The TM method is synonymous with exceptional expertise and procedures in the vineyard, in winemaking, and in the bottle. Limited crops, meticulous leaf-pulling to ventilate the clusters, which are then quality-selected and picked by hand—all this defines the quality of the raw materials that are quickly brought to the cellar in small boxes. The clusters are subjected to a second quality-selection, totally by hand, just before de-stemming. The hallmark that consistently characterises our wine is their harmony, the result of their refinement and cleanness, in addition to the unique imprint of each cru vineyard, which gives them distinctive sensory profiles that heighten their individuality. The Tenuta Montemagno experience begins with as cellar tasting of our wines, whether a vertical tasting of our Barberas or a horizonal tasting that reveals the character of Monferrato.